This year marks the 20th anniversary of the Good Friday Agreement. As we reach this milestone, we believe that it is time to not only celebrate the achievement of the Agreement and the role that civic society played, but to reflect on its implementation and consider how its outstanding provisions regarding rights and equality can be delivered. We are hosting a series of seminars, beginning on the date that the Agreement was reached, to consider the opportunities and challenges civic society faces in realising the rights-based society envisaged within the Agreement. We want to discuss how we can construct a new campaign in solidarity with each other in order to deliver this goal. We are asking for your input and participation in these seminars, which we hope will lead to a renewed, collective effort to implement the rights-based society promised within the Agreement. On 10th April we intend to reflect on the provisions of the Agreement relating to human rights and equality, discuss the challenges facing their implementation, and outline the programme of seminars that will follow through the rest of 2018. Immediately following the introductory seminar on the 10th April we would also invite you to join us at Stormont for a photo opportunity to mark the 20th anniversary of the Agreement and call for the implementation of a genuine human rights and equality framework and on that basis a return to devolved government. 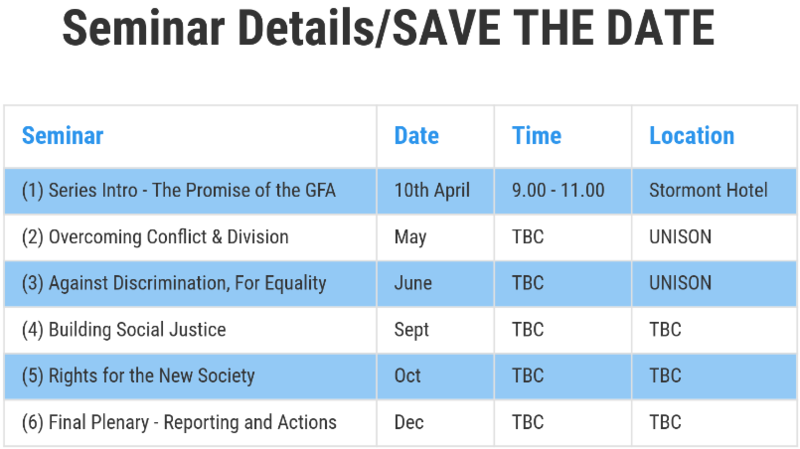 The first Seminar, “Series Intro – The Promise of the GFA’ will take place on 10th April from 09:00-11:00 at the Stormont Hotel. To book your spot please see here. Please also see the poster here.